With only weeks to go until the release of Star Wars: The Force Awakens, everyone has Star Wars fever. Over the years, the universe of Star Wars has spawned countless video games. Some, like Masters of the Teräs Käsi, were pretty bad. Star Wars has been the basis of first-person shooters, third-person shooters, action games, flight simulations, real-time strategy, and even point-and-click adventures. 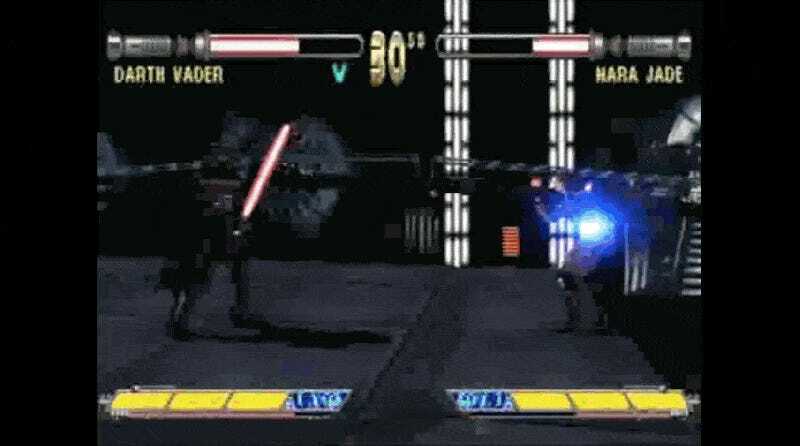 But only once in Star Wars’ nearly 40-year history has it produced a fighting game. In October 1997, however, LucasArts decided it was a good idea. Set between the events of A New Home and The Empire Strikes Back, the Galactic Empire is super pissed and wants revenge against Luke Skywalker and his buddies. They enlist the help of Arden Lyn, a female character created for the game and creepily eyeballed by Luke at the top, to finally take them out. After the stunning defeat and loss of the Death Star handed to the Galactic Empire, the Emperor demands drastic measures for a swift retribution against the Rebel Alliance. The Emperor calls upon the services of a mysterious young woman, Arden Lyn, wise in the ways of an ancient and almost forgotten fighting art know as teras kasi. Do we really need to a lore-driven reason to justify characters beating each other up? Wait, you’re telling me Tekken 7 has an ongoing story? OK, whatever. Masters of the Teräs Käsi was released during a particular high for Star Wars games, with Dark Forces II coming out only one month prior, and Shadows of the Empire (aka the game with the Hoth stage) having hit the N64 the year before. This game was, unfortunately, not one of the good ones. It was a bad fighting time during a time when there were lots of better options out there, with little to offer beyond the novelty of watching Star Wars characters beat the crap out of each other. Sluggish, boring, and without much depth, it was quickly brushed under the rug, to only be remembered in articles like this. As with most fighting games, each of the characters had their own, unique ending. It’s cool to imagine a version of Star Wars where Vader wins, I guess? Unsurprisingly, reviewers were not kind to the game at the time. Douglas also called the game’s premise “brilliant.” Make of that what you will. What is teräs käsi, exactly? It’s a fighting style first mentioned by sci-fi writer Steve Perry in the 1996 book Shadows of the Empire. The book was part of an ambitious multimedia project by LucasFilm, which included the N64 game. Even Perry isn’t really sure who came up with it in-universe, though. As mentioned earlier, the game’s villain, Arden Lyn was a new character. LucasArts realized Star Wars wasn’t overflowing with women to put in the game. You might have picked upon by now that Masters of Teras Kasi did not become a franchise, and Star Wars stayed away from fighting games for a while. “For a while” isn’t forever, but it took more than 10 years before it returned in 2008. For one, there was the Wii exclusive Star Wars: The Clone Wars -Lightsaber Duels. I dare you to say that name ten times fast. Then, it licensed out Yoda, Galen Marek, and Darth Vader for Soulcalibur IV. (Galen Marek was Darth Vader’s secret apprentice from in The Force Unleashed.) At first, Yoda was exclusive to Xbox 360, while Darth Vader was exclusive to PS3, but both showed up on the other machine as downloadable content a few months later. Marek, however, was an unlockable character in both versions. Star Wars hasn’t been seen in a fighting game since, but how come Masters of Teras Kasi isn’t on PSN yet? We’re only a few years from its 20th anniversary!